Buy American Meter RABO Meters HERE! Elster Gas is pleased to announce the introduction of their RABO rotary meter into the North American market. Elster American Meter Company LLC will market the new product bearing the Elster Instromet badge, which positions it as a global product for universal application. The RABO meter will come in four meter sizes ranging from 3,500 ACFH to 14,000 ACFH maximum capacities with a pressure rating of 290 PSIG, and boasts superior performance. Finished inventory will be carried in Nebraska City, NE, starting August 15, 2014, to better serve customer demand. Elster American Meter’s current RPM rotary meter product line will remain in production through 2015 to facilitate the customer approval process and help ensure a smooth transition to the RABO product line. and IRM rotary meter product lines with new developments into a single product. The new RABO offers a feature set that meets virtually all market applications in one simple design. Rotary-All-By-One, simply, all-in-one! The RABO meter utilizes the rotary-type positive displacement principle of operation which makes volumetric measurements by displacing finite volumes of gas. The positive displacement occurs within a cavity formed between the meter’s internal housing and its rotating impellers. The counter-rotating “figure-8” impellers turn as a result of pressure drop across the meter’s inlet and outlet created as downstream gas is consumed. The rotating impellers separate the flowing gas into small, finite, volumes and are counted using a mechanical index. 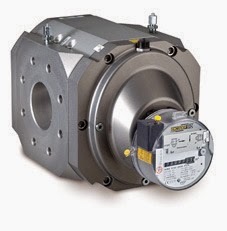 Elster RABO flow meters come equipped with a drive magnet as standard equipment for easy adaptability of a low frequency pulse generator. The pulse generators are attachable to the exterior of the index cover, and can be retrofitted or changed without opening the index. They also have sealing capability to visually detect tampering. All models include 2 independent switches and a tamper circuit. Pulse value is 10 acf (0.28 x am3) for all meter sizes. IN-S11 and IN-S12 come with mating connector, no cable included. Gaskets and bolts are necessary for mounting a meter in the gas line. Gaskets and strainers are high quality Garlock® BLUE-GARD® Style 3000, and Grade 5 bolts are Xylan® coated for increased corrosion resistance and reduced friction. Gasket strainers are an effective way to to protect the meter and downstream equipment from weld slag and other debris in the gas system.